Summer, cool baptismal kit for boys. 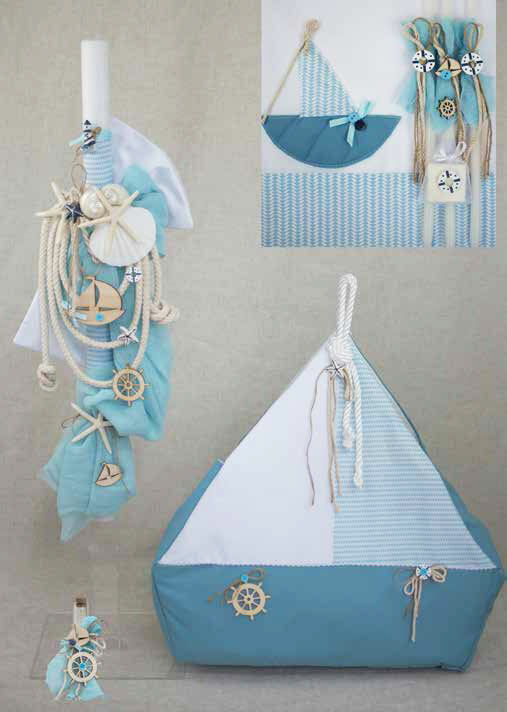 Its theme is seaworthy, and its colors give the coolness of the sea. Blue and white fabric tied on the candle and with nautical beige rope are tied, starfish, shells, boats, navy steering. The same ornaments decorate the bottle of oil and the three candles. The towel has tapped a beautiful boat. and striped blue beam. The large original suitcase that comes with it, is a beautiful boat with cloths and beautiful adornments. The set includes: a candle, a large boat-bag, three candles, a soap, a bottle of oil, laurels, underwear and towels. https://www.preciousandpretty.com/2018/07/summer-christening-set-with-ship-for-boy-E800.html Greek Wedding Favors|Orthodox Crowns|Stefana|Baptism Invitations Summer Christening set with ship for boys E800 Christening set for greek summer baptism with beautiful ship theme. Product #: Greek Wedding Favors|Orthodox Crowns|Stefana|Baptism Invitations_2712893828845760327 5 stars out of 5 reviews.